Injury to the brain or spinal cord affects nearly 2 million people in the United States each year, causing permanent functional disabilities including paraplegia, quadriplegia, and cognitive disorders. Every 15 seconds someone receives a head injury, and every five minutes one of these people will die. Survivors of severe brain injury typically face five to ten years of intensive services. The cumulative mean cost of this cars is currently 4 million dollars per patient. Bringing new treatments from the laboratory setting to patients requires an integrated effort among basic researchers, clinical researchers, and clinicians. With this in mind, the UCSF Brain and Spinal Injury Center (BASIC) was formed in 2002 to promote collaborative basic, translational, and clinical studies on injuries to the brain and spinal cord. 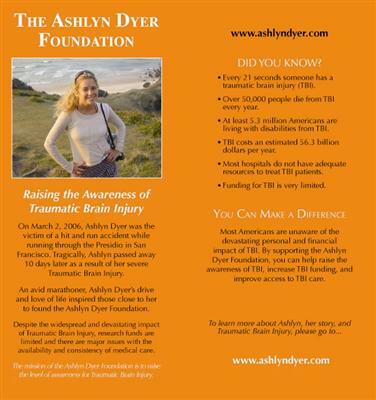 This presentation gives basic information about TBI (Traumatic Brain Injury) and how it affects those who are suffer this coniditon as well as those who have friends or family with this condition. Dr Manley treated Ashlyn and TBI is the condition that the Ashlyn Dyer Foundation now benifits.